Why is my picture blurry? I'll tell you at the end of the post. Sometimes the light is perfect, the moment is right, but when you get home you find out that your photo is blurry. Arrgh! Well... it depends. There are two primary reasons your photo might be blurry -- your camera isn't focused properly or you are experiencing camera shake. Within each of these situations, there are several considerations. No matter what a camera manufacturer tells you, your camera doesn't know what you have chosen as your subject. The camera can make an educated guess based on common scenarios or fancy algorithms, but only you really know. If you understand that premise, it makes sense that there are times when your camera might choose to focus on the wrong element, leaving your true subject out of focus. Here are some questions to help you diagnose that situation. Are you using the multi-point auto focus selection? In that option, the camera determines what it should use as a focal point. It chooses what looks most prominent in the frame and focuses there. If you decide your focal point is not one of the more obvious elements in the frame, your camera will focus on the wrong thing, and your subject will look blurry. Are you using the manual selection of your auto focus point? Manual selection lets you tell the camera which focal point to use. Then you can make sure it is in the right place. What if you forget your focal point is in the lower left of your frame, while your new subject is in the upper right? Same problem. You will have the wrong thing in focus. Check to see which focal point is activated. Is your camera is set on continuous focus? This is a problem if your subject isn't moving. Continuous focus (AFS-C on Nikon or AI Servo on Canon) is designed to be used when you are photographing a moving subject. If someone is riding a bicycle toward you, continuous focus will allow the camera to continue focusing on your subject as it approaches you. Your camera tracks your subject and then predicts where it will be when you finish depressing the shutter. While this is great for a subject in motion, it can lead to problems on a stationary object. As you compose the frame, the camera will continue focusing wherever the focal point is at the moment. That makes it easy for you to inadvertently focus on the wrong subject. Is your camera or lens in manual focus? This is easier to overlook than you might think. You might put the camera in manual focus by accident. Then, no matter what you do, you won't get the camera to autofocus. Voila. Blurry pictures. When you depress your shutter, you move your camera. If the shutter speed is too slow, that movement shows up in your picture as camera shake. It looks like a blurry picture. To avoid camera shake, always use a shutter speed that equals your focal length or faster. 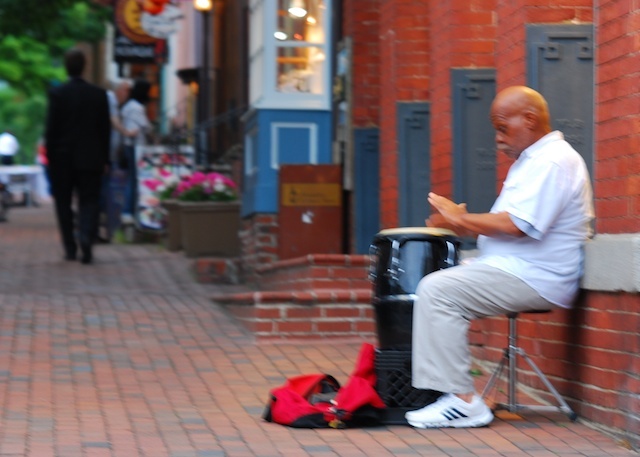 For instance, if you are zooming to 50 mm, you should shoot at 1/50th second or faster. If your shutter speed is any slower, you should use a tripod. Some lenses have built-in stabilizers that correct camera shake. Nikon lenses call it Vibration Reduction (VR) and Canon lenses call it Image Stabilizer (IS). Turn this feature on to have the lens correct your camera shake. You can then cut the minimum shutter speed number in half. For instance, if you are zoomed to 50 mm and should normally shoot at 1/50th a second, you can slow your shutter to 1/25th a second with the stabilizer turned on. Some manufacturers claim as much as four stops. It's best to experiment and see how much you can slow down your shutter speed before you begin seeing camera shake. 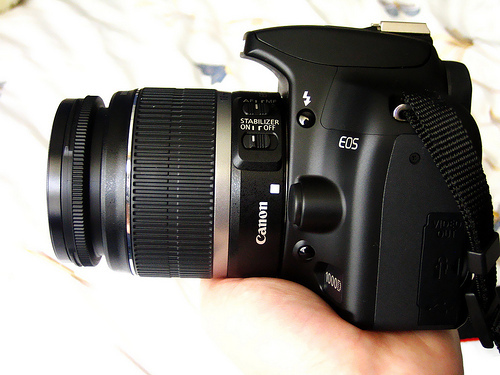 Canon lenses use the Image Stabilizer feature to prevent camera shake. Nikon lenses call this feature Vibration Reduction. Flickr photo by Amy Dianna. What if you set up your autofocus properly, and your shutter speed is fast enough, and the lens still won't focus? Try these considerations. You might be too close. Try backing away from your subject if you are very close. If you are too near the subject, it might prevent the camera from focusing accurately. Your subject might not have enough contrast. Your image needs to have some detail that provides contrast. If you try to photograph a solid sheet of white, the camera can't compare adjacent pixels to determine focus. Use a point of contrast to allow the camera to focus. You might have an extremely shallow depth of field. You can create shallow depth of field with a low aperture number, a long focal length or a short distance to your subject. Use all three or even one in extreme, and you can have a tiny part of the image area in focus. It can be so shallow you get the impression the entire photo is blurry. Finally, you might have a bad lens. This is a final option because 99/100 times, the real issue will be user generated. That's right, it will be your fault. Before you blame the lens, put the camera on a tripod, select a fast shutter speed, use a large f-stop (long depth of field), in lots of light, with a very clear subject. If you do all those things and the image is still blurry, you might have an equipment issue. In most cases, a blurry picture will be your fault -- either a setting or in execution. Go back to the top of this list and start your diagnoses all over again. Somewhere in that process you should find the answer to your question why your pictures are blurry. Note: In the example photo, I shot at 105 mm, f/3.5, 1/30th second. My photo is blurry because of camera shake.